We had driven for some time when I heard Claire say, ‘How about stopping soon?’ I didn’t need any encouragement. There was still an hour to go before sunset but I’d had enough adventures for one day and just longed for a good rest and something to eat. ‘Look!’ exclaimed Claire, pointing at a large open area on our left. ‘Why don’t we camp there?’ The place seemed indeed ideal. There was about 100 yards of flat space and towards the end grew some trees behind which we would be able to hide. I veered off the track, but we hadn’t covered more than 20 yards when the vehicle began to slow down as if it were struggling against thick mud. I immediately tried to turn back but it was too late. 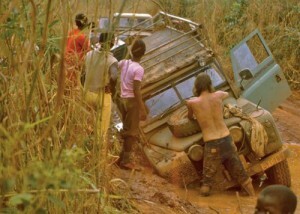 The Land Rover began to sink and then the engine stalled. We had driven straight into a swamp! 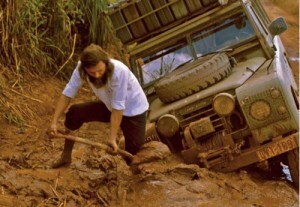 I swore a couple of times, grabbed the spade and started digging at the mud around the wheels, but to no avail. The foul stuff ran back as soon as I shovelled it out. We were well and truly stuck. That was all very well, but I didn’t see how we could possibly sleep with the Land Rover tilted at that angle. The left front wheel was at least a foot lower than the right and two feet below the back wheels. And I was filled with dread when I thought about the mosquitoes, which would soon begin to come out in droves. I wasn’t going to wait. I wanted to get out now! When you’re in a desperate situation like this one, you find your power of concentration magnified. The winch, I suddenly thought. There were some medium-sized trees not too far away. If I could make the winch work again, it would pull us out! I shot into action, got out the electric command cable and began to stick the wires into the holes in the cylindrical plug while Claire began to unwind the steel cable from the roof rack. This time there were no Africans looking over my shoulder, I could concentrate and, yes! When I tried the seventh combination the winch began to rewind with a plaintive sound. We were saved! I pulled the steel cable towards the clump of trees some 20 yards away, slung it around them, ran back and pressed the rewind button of the command cable. Slowly the slack cable started to rewind and became taut. This is it! I thought, and carried on pressing the command button. 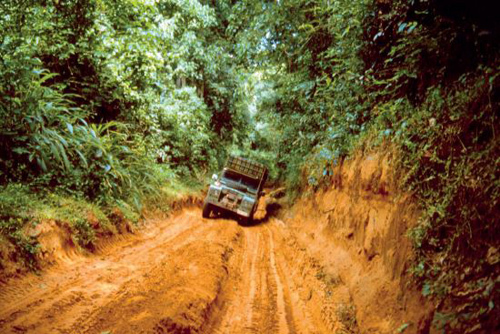 The rotor kept turning, the steel cable kept rewinding, and yet … the Land Rover didn’t move! What was going on? Then I turned around and couldn’t believe what I saw: the trees were coming slowly towards us! It was hallucinatory. Instead of the trees pulling us out, the Land Rover was pulling out the trees! Obviously, trees in a swamp have shallow roots but still, this was just too much. Claire shook her head, unhooked the cable from the trees, took the command cable out of my hands and rewound the steel cable completely, while I sank down on the bumper wondering if things could get any worse than this. I looked up at the heavens in misery and only then did I notice that the sky, which had been blue just moments before, was darkening rapidly. Walls of black clouds were piling up in the sky, there was an eerie silence and the air had become very oppressive. A mighty storm was rapidly building up, driving whirling masses of dark, rain-swollen clouds towards us. If they burst overhead, the Land Rover would sink into the swampy ground. This was surely the end! Then I saw them: a dozen men carrying machetes appeared silently along the road, turned towards us, moving purposefully, and stopped 10 yards away. They took up position in a semicircle and began to stare at us with undisguised hostility. ‘Why you not come to village?’ The chief sounded outright hostile. ‘We didn’t know that.’ I looked at the chief imploringly and saw him relax. Contact had been established and I felt the atmosphere become less tense. This seemed the moment to appeal to the men’s better selves. ‘Why don’t you help us out?’ I pleaded. ‘Then we can go to your village. You are all strong men and I’m sure you can do it.’ The chief hesitated, but finally said, ‘Good.’ He made a sign to his men and to my great relief they put down their machetes and placed themselves around the Land Rover, ready to lift it out of the marsh by sheer muscular force. I breathed a sigh of relief and quickly climbed up on the roof rack to throw down jerry cans, spare wheels, tyres and our plastic water containers to lighten the load. Then I got behind the wheel, switched on the engine and put the gears into backward position, four-wheel drive and high-gear ratio. The men were heaving with all their might while I revved up, but nothing happened; the wheels were just spinning in the mud. But the men kept hauling and suddenly I felt the Land Rover budge; it began to move very slowly and then, all at once, it shot backwards. I kept pushing the accelerator until I was out of the quagmire and back onto the track! How the hell does he expect me to take all his men to the village? I wondered, but I soon found out. Several Africans climbed up on the roof rack where they settled down between the jumble of containers, jerry cans and wheels, whilst two, who had been in the process of joining the others up there and found there was no space left, just stood on the back bumper, clinging on to the end of the rack. I shook my head but there was nothing I could do to stop them. I clambered behind the wheel and Claire had only just got in on the passengers’ side when the chief came in after her. He was a big man but he moved up and managed to make room for another stout fellow by pushing Claire literally onto my lap. Four men were still standing about looking for a place and I was just asking myself where they could possibly go when, to my utter horror, I saw them crawl up on the bonnet straight in front of my eyes! We’ll never make it, I thought as I started. The track had become a running stream by now; the rain kept coming down in sheets; it was pitch black outside and visibility was reduced to nothing. The Land Rover is sure to collapse under all this weight, I kept worrying, or else we’ll get sucked into the mud or slide off the track and end up in a ditch. Fortunately, lightning flashed every few seconds, illuminating a surreal world. 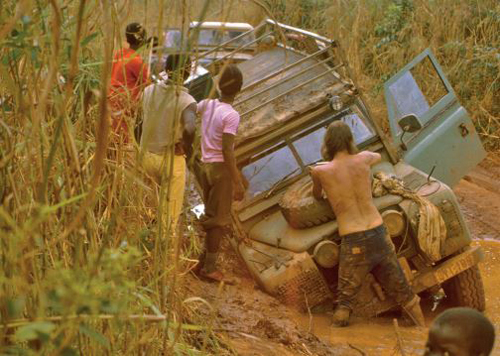 Each time there was a vivid flash the muddy track leapt to life amidst torrents of water, but I couldn’t see very clearly with four men huddled on the bonnet right in front of me. The rain kept drumming noisily on the Land Rover; the windscreen wipers were working at full tilt; everything was damp inside and water vapour condensed on the windows. I felt like a sardine in a tin: I had Claire on my knees and was squashed against the door by the fat chief and his companion who took up all the space. I was just about able to steer. Please, please, I kept praying while we skidded along, let us reach that village. 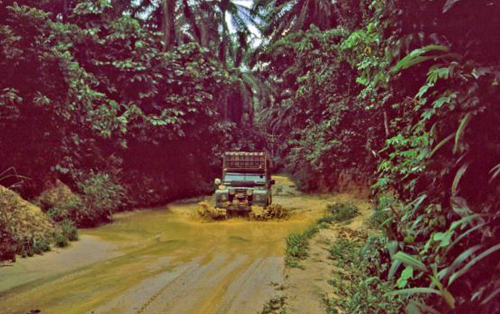 Most of the time I could only guess where the middle of the track was; we banged into several potholes and once the wheels slipped uncontrollably towards the side and into the muddy bank, but we slid on. An hour or so later, we saw the light of fires loom up in the darkness and limped into an open space surrounded by huts. The rain stopped as abruptly as it had started and the thunder and lightning gradually passed into the distance. As the Africans leapt onto the ground, the Land Rover seemed to heave a sigh of relief and rose several inches; and then the entire population of the village came running forward, surrounding us with shouts of excitement while we stumbled out. I sighed, slipped a hand into my pocket, brought out all the local money I had left – some 300 zaires (about £15.00 in those days) – and handed it over. The chief just took one look at the banknotes, spat on them and threw them on the ground. Then he stared at me with furious, bloodshot eyes, which made me recoil. ‘We want big money!’ he shouted in my face. There was an intake of breath all around, the men began to surround us and I dearly wished we were somewhere else. ‘And … how … how much do you want?’ I asked, almost stuttering. This was outrageous! It was a sum of money those men had never seen together in their whole lives! I didn’t have 30,000 zaires anyway and I was racking my brain trying to think how we could get out of here. I took a step back towards the Land Rover in the vain hope that I would be able to jump in and drive away, but there was no possible escape. The men closed in upon us with threatening looks in their eyes, holding their machetes at the ready … There was a tense silence; the hostility of the men was almost tangible. I held my breath, waiting for the chief ’s reaction, but his face remained closed. Then, to my relief, I saw him become interested. ‘You have vitamins?’ he asked. Suddenly the chief looked pleased and I sensed a change of mood. Some of the men began to smile and the atmosphere relaxed almost visibly. ‘Can we have them now?’ The chief held out a hand. We opened a tin of sardines, dug up a piece of stale bread, ate the lot and felt so exhausted afterwards that we lay down and immediately went to sleep. The eastern horizon was only just brightening when we were woken up by the sound of women pounding manioc in their mortars; roosters began to crow with a great show of energy, almost as if they were trying to burst their lungs, and we heard a pig foraging and grunting nearby. Morning in the tropics! Soon children were scampering around the Land Rover, pushing each other, trying to peep in; little fingers began to scratch our windows, but fortunately our curtains were drawn. We would have liked to sleep on but this was impossible with all those little voices around, hens cackling and women beginning to bang pots and pans for breakfast. We got up, made a cup of tea and had breakfast sitting on low African stools surrounded by children. Our clothes were a messy damp pile waiting to be washed but the sun shone and there was that unmistakably joyful feeling mornings give you in Africa. We hadn’t even finished our breakfast when men began to surround us, looking at us with eager eyes. It brought me back to reality. I knew we couldn’t postpone the hour of reckoning any longer, and I just hoped we would get away with it. After some energetic pushing and pulling, the chief managed to line up his men and then moved to the head of the long column which trailed away between the huts. I solemnly deposited ten suppositories into the chief ’s cupped hands and then moved onto the men immediately behind him, who were the ones who had helped to lift the vehicle out of the swamp the previous night; they got six or seven each; after that I gradually reduced the dose until I got to the end of the line where the last men had to be pleased with only one or two suppositories because by that time the box was nearly empty. We were about to hop into our Land Rover when the chief ’s son came towards us. He wanted to go to a town 20 miles further and asked if we could take him. ‘All right,’ I said, ‘jump in,’ and we drove off without any further delay. It was a relief to be out of that village. The chief ’s son was a bright young man who spoke perfect French. He was the one who had urged us to speak the previous night and I was interested to find out what had really happened. When I had driven into the swamp I thought we hadn’t been seen but, of course, there’s always someone around in Africa and two women who were returning to their village had noticed us and immediately alerted the chief. Unfortunately for us there had been bandits around in the area a week before and they had attacked a neighbouring village and killed several people. Everyone was out for revenge and when the women who had seen us told the men we were camping out, they wanted to go and kill us since, obviously, only witches and badly intentioned people would willingly stay out at night! I sat there, stunned. Only now did I fully realise that, from the start, they had intended to kill us. The scenes in the marsh the previous night unfolded again before my eyes. We had escaped death by a hair’s breadth … It might so easily have turned the other way. ‘Tell me,’ I asked after a while, ‘why did the men in your village want vitamins?’ It was something that had intrigued me the whole morning. The chief ’s son stared at me as if I were asking him to talk openly about a taboo subject and he kept an embarrassed silence. ‘You can tell me,’ I insisted. This was totally unexpected and it aroused my interest. Here was an occasion to have an African’s view on what was a very complex subject. ‘And why do you think they rule the world?’ I asked him. I sat there, gaping. Then, in my mind’s eye, I saw the chief and his men swallowing the suppositories I had given them in quick succession, expecting cleverness to follow instantly. I was glad that we were out of that village and would never have to pass that way again. 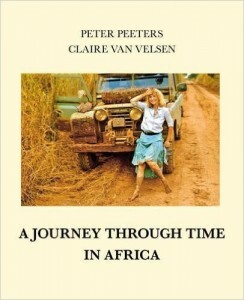 Extracted from their very excellent account of their journey, now published as A Journey Through Time in Africa.